The Shop Play Win Monopoly Albertsons 2019 is here! 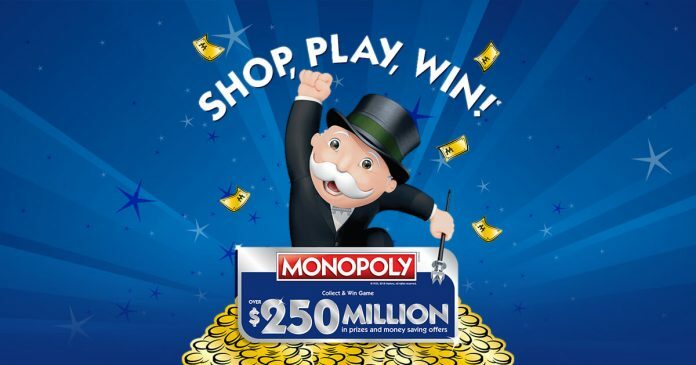 Shop, play, and win the Albertsons Monopoly Game at www.ShopPlayWin.com beginning on February 6, 2019. This year, you could win from over $250,000,000 in prizes and money saving offers. And if you are lucky enough to find Albertsons Monopoly 2019 Rare Pieces and complete the Albertsons Monopoly Game Board 2019, you might win a $1,000,000 guaranteed prize. In order to participate, you’ll need to obtain Abertsons Monopoly Games Pieces. Free game pieces can be obtained with each purchase transaction at any participating Albertsons, Safeway, Pavilions, Carrs, Vons,Randalls, Eagle, Pak ‘n Save, Tom Thumb, ACME Markets, Jewel-Osco, Shaw’s Supermarkets,Star Markets, United Supermarkets, Market Street, Amigos, United Express, Albertsons Market,Lucky (Southern California only) and Super Saver store locations. You may also obtain bonus game pieces with each purchase of a participating vendor product or with every 10 bonus items purchased in one shopping visit. Alternatively, you may also obtain game pieces without purchase by requesting 1 game piece and 1 bonus game piece by mail. Simply send a self-addressed, stamped envelope to SHOP, PLAY, WIN! MON-12 Collect and Win, Game Ticket Request, Attn: Promotions Coordinator, P.O. Box 813368, Smyrna, GA 30081. Your game piece will also contains 4 game pieces which can be placed on the exact corresponding matching prize play area spaces on the Albertsons Monopoly game board 2019. Some Albertsons Monopoly 2019 pieces are hard to get but if you find them, you will win bigger prizes. If your game piece reveal an online game code, a 12-digit alphanumeric code, submit it at www.shopplaywin.com to see if you are an instant prize winner. Online Game Codes may also be sent by mail by hand writing your full name, address, phone number, age on a 3″ X 5″ index card and affixing your Online Game Codes coupon to the index card. Then, mail the index card in a 1st class-stamped, hand addressed envelope to: 2nd Chance Sweepstakes, P.O. Box 441208, Kennesaw, GA 30160. Please note that each online game code may be entered only once, regardless of the method of entry. What You Need To Know About The Shop Play Win Monopoly Albertsons 2019? Eligibility: In order to participate in the Albertsons Monopoly Game and be eligible to win a prize, you must be at least 18 years of age or older and be a legal U.S. resident of one of the following eligible states: Arizona, Arkansas, California, Colorado, Delaware, Idaho, Illinois, Indiana, Iowa, Louisiana, Maine, Maryland, Massachusetts, Montana, Nevada, New Hampshire, New Jersey, New Mexico, North Dakota, Oregon, Pennsylvania, Rhode Island, Texas, Utah, Vermont, Washington or Wyoming. Florida is excluded in this Promotion. Sweepstakes Period: The Monopoly Albertsons 2019 starts on February 6, 2019 and ends on May 7, 2019 or when all game tickets have been distributed. Limit: There is no limit to the number of entries each individual can receive throughout the Game Period. Next articleAlbertsons Monopoly 2019: What Are The Rare Pieces? Can’t get on the Monopoly website, is it down? The site is down. They seems to have some issues but it will probably be back soon. I have the rare $1,000,000 piece. 8Z07G. If anyone is interested shoot me an offer! Did anyone win anything in 2018 that eas over a value of $20k? Where are the “game codes”? I’ve tried every number on the game pieces and they’re ALL rejected. I have lots of extra pieces that I don’t want to throw away. Will consider swap or make offer. I have a lot of extra pieces if any one need anything. I have 8y16H (million dollar vacation home) for sale. Send me your offer to purchase it by text or by voicemail. I have all the pieces to the 1 Million cash except: 8z07g, 8z08h. If you have the other two. Willing to make a deal if your willing to go in it together. I have all the pieces to the 1Million Vacation Home except 8y14f and 8y16h. If you have them I’m willing to make a deal together. I HAD A PROBLEM REDEEMING THE FANDANGO GIFT CARD AFTER COLLECTING 20 WINNING FANDANGO TOKENS. I DID NOT GET AN EMAIL GIVING ME THE CODE TO BUY FANDANGO PRODUCTS. I WAS VERY DISAPPOINTED AFTER WINNING SO MANY OF THEM. I THINK THAT NOW I AM ON THE 3 GIFT CARD THAT I DID NOT RECEIVE A PROMO CODE VIA EMAIL AS THE ALBERTSONS ON CLINTON KEITH SAID WOULD HAPPEN FOR ME. I AM DISAPPOINTED AND MAY NOT PLAY ANYMORE. I WAS A GOOD ALBERTSONS AND VONS CONSUMER. your website to log in is terrible. can you please do something to make more consumer friendly. I cant log in. This Monopoly game is a MESS. Always have trouble getting to the website to enter game pieces. Typical Albertsons management style. I wish Safeway would have bought Albertsons it would all be run better! My Albertsons is not listed on the site. I want my store to get the credit for customer purchases. I am worried it might get closed. As far as the game I have had no problems. I love swapping with someone because I need these numbers. 8f77a, 8c91a, 8c93c, 8m54b, 8e82b, 8e85e, 8g75b, 8h72d. And I will give u 8j66b,8y16h, 8b99d, 8b00e, 8d86a,8d87b, 8r40d. Or text me 1+7604856476. Ugh, this game is frustrating. Will not be entering this anymore. Stupid monopoly game suspended my account for no reason. It wasn't like I was winning anything. All of my online game codes can't be entered now, what a waste of time and energy. Albertsons is a mess, will rethink my shopping at their store. I have 24 potential wins if I can only get the one missing ticket of each of these 24 games. Been playing since day one. I won 6 Fandango rewards. The game rules said they must be redeemed by July 31. I only used 1 reward, since there were no movies I wanted to see. Now when I go to the web site, it does not work. Help! I did not write down or copy the codes, thinking that it would be available through this month. I want my prizes! Can anyone give me a link to the site where you can see your list of winning numbers? I won 8 Fandango rewards. I only used 1 reward, since there were no movies I wanted to see. Now when I go to the web site, it does not work. Help! I did not write down or copy the codes, thinking that it would be available through this month. I want my prizes! Can anyone give me a link to the site where you can see your list of winning numbers? I am looking for folks who willing to switch tickets or cash offer for Monopoly Tickets for 2018. Please email me for more information. Hi am am too! What do you have or what tickets are you looking for? I never got to register, the site kept telling me to enter a “valid” phone number” when I put in my phone number, apparently the drone doesn’t know what a “valid” number is, the phone works at our house. Albertsons Monopoly Gama is a scam. Law suits will be pending. Can’t log into http://www.shopplaywin.com, only NM and TX. Not valid in California. I am down today for the first time and looking at the comments, a lot of people are having difficulties. And, my numbers are totally different from what anyone has in order for me to trade. Who out there has a Monopoly sheet with numbers starting 101AA to 243HD?? I am missing like one for everything. Soooo close but now shut down. “F”n game. Takes hours to do this stupid game as it is. i have 194WD, one of the two tickets needed for a $25,000 kitchen makeover.